The NHL Network will have an afternoon doubleheader for Canadian viewers on Monday as part of the League's six-game schedule. Monday's action gets under way at 1 p.m. ET with the first game of the TV twin bill, a matinee on Long Island, where the Nashville Predators will make a rare visit. Nashville brings a four-game winning streak to the Nassau Coliseum after beating Philadelphia 4-2 on Saturday; the Islanders beat Buffalo by the same score on the same night. Four days after winning the Bridgestone Winter Classic in Philadelphia, the New York Rangers will try their luck at the other end of Pennsylvania when they visit the Pittsburgh Penguins in one of five games on Friday's NHL schedule. The Rangers come to Pittsburgh at the top of the NHL standings after Thursday's 3-2 overtime victory against Florida at Madison Square Garden. The Penguins are playing their first game of 2012 -- they’ve been off since a 3-1 loss at New Jersey on Saturday. The NHL Network will air the game in both the United States and Canada, beginning at 7 p.m. ET. Fans who want an inside look at the life of an NHL player will get their chance this weekend, when NHL Network re-broadcasts the latest 'NHL 36', which followed Boston's Patrice Bergeron for 36 hours as he flew with the Bruins to Phoenix for a game against the Coyotes last month. The show, which originally aired this past Wednesday on NBC Sports Network, will be shown Saturday at 12:30 p.m. ET on NHL Network-US and at 6:30 p.m. ET on NHL Network-CAN. 'NHL 36' will get another encore presentation on Sunday at 6:30 p.m. ET on NHL Network-US and at 1 p.m. ET on NHL Network-CAN. Bergeron is the second player to be profiled on 'NHL 36' following Chicago's Patrick Kane. 'NHL 36' is a 10-part documentary series produced by NHL Original Productions that provides viewers the ultimate behind-the-scenes peek into the life of an NHL superstar over a 36-hour period. NHL Original Productions will continue to develop and produce more long- and short-form hockey programming to be shown on the NHL's media platforms. The Flyers and Rangers may have gotten the attention of the hockey world Monday with the 2012 Bridgestone NHL Winter Classic, but now it's time for minor leaguers and college kids to get in on the outdoor fun and NHL Network will have fans covered. This weekend NHL Network will be broadcasting three outdoor games across the U.S. and Canada. On Friday, the AHL's Hershey Bears and Adirondack Phantoms will use the same ice the Rangers and Flyers used Monday at Citizens Bank Park, and NHL Network-US will provide a full replay Saturday afternoon at 4 p.m. ET. As the final four teams at the World Junior Championship vie for gold on Tuesday, fans in the United States can catch all the action on the NHL Network. The Network will broadcast the semifinal between Finland and Sweden at Scotiabank Saddledome at 5 p.m. ET, to be followed by Canada against Russia at 8:30 p.m. The winners will face off for the gold medal Thursday at 6 p.m. ET. As the hockey world gets ready for the 2012 Bridgestone NHL Winter Classic, NHL Network will have all the information you need, as it starts broadcasting live Thursday from the site of the outdoor hockey extravaganza, Philadelphia's Citizens Bank Park. NHL Network will chronicle the transformation process of turning the famed ballpark into an ice rink, cover daily press conferences and provide weather reports in collaboration with the Weather Channel. NHL Network is the top destination for fans to keep apprised of everything happening in Citizens Park Bank leading up to and following the fifth annual outdoor game. The Christmas break has already arrived for eight NHL teams. For the other 22, there's one more game before they take two days off for the holiday -- and for the New York Rangers and Philadelphia Flyers, there's more at stake than just two points. The Flyers come to Madison Square Garden for one of 11 games on Friday, the final night of action before the NHL takes off for the holiday weekend. The Rangers, who tuned up by beating the Islanders 4-2 at MSG on Thursday, can move past the Flyers into first place in the Atlantic Division with a regulation win -- and can take over the top spot in the Eastern Conference with a win and a regulation loss by second-place Boston. The Flyers come to the Garden off a 4-1 win in Dallas on Wednesday. NEW YORK -- NHL Network will get a jump on the New Year with a number of new enhancements including a new network logo, re-branded highlight show and new ad campaign. The Net will also begin broadcasting from Citizens Bank Park™ in anticipation of the 2012 Bridgestone NHL Winter Classic on Dec. 29, providing fans more with more hours of original programming around the annual event than ever before. On December 26, NHL Network will officially switch over to its new logo (attached) and launch NHL Tonight – an evolution of the 10 p.m. edition of NHL On the Fly – airing seven days a week. Kathryn Tappen, host of NHL Tonight, will be joined by a rotating lineup of hockey insiders and analysts that will serve fans with every highlight, every game. Saturday doubleheader, 'NHL 36' on Network-U.S. The NHL Network has a full day of hockey in store for U.S. viewers on Saturday with a doubleheader and the Network's premiere of "NHL 36" chronicling the life of star Chicago Blackhawks forward Patrick Kane. The action gets under way at 1 p.m. ET as the Philadelphia Flyers host the Boston Bruins in a battle between division leaders and teams that have met in the second round of the Stanley Cup Playoffs in each of the past two springs. The Flyers rallied from a 3-0 series deficit en route to making the Stanley Cup Final in 2010, while the Bruins swept last year's rematch and went on to win their first championship in 39 years. "NHL 36" then airs at 4 p.m. Providing the ultimate behind-the-scenes peek into the life of a hockey superstar, the NHL Original Productions show takes viewers into Kane's world for 36 straight hours as he lives the life of a not-so-average 23-year-old. Through an array of microphones and isolated cameras, the 30-minute documentary offers unique insight into Kane's game on the ice. The show also features interviews with Kane's family. 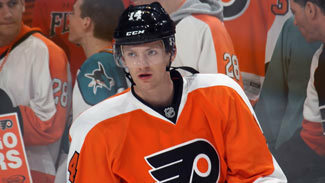 MONTREAL -- Sean Couturier was a longshot to make the Philadelphia Flyers' roster out of training camp, but just over two months into his NHL career, he finds himself filling a major role on one of the League's top teams. With the NHL's leading scorer, Claude Giroux, sidelined indefinitely with a concussion, the 19-year-old Couturier -- the eighth pick of the 2011 Entry Draft -- is being asked to fill the void between Scott Hartnell and Jaromir Jagr on the Flyers' top line. Thursday's game against the Canadiens (7:30 p.m. ET, NHL-US, TSN) will be his second in that role, and while some may be surprised to see a junior-age player in such a prominent position so soon on a top team, coach Peter Laviolette feels the rookie is ready for the added responsibility. "Early on in training camp we had him killing 5-on-3's, we had him on the power play, we had him playing against other teams' top players," Laviolette said of Couturier. "After camp was over, I made a decision to not change that. He did everything as well as he could and we decided to start the season with the same responsibilities for him. He hasn't disappointed us."